Celebrate the best of the blueberry season with citrus-flavored chicken breasts topped with refreshing blueberry chutney. In a shallow pan, whisk together all ingredients except chicken breasts. Remove and reserve 1/4 cup of the marinade. Coat chicken in the remaining marinade in the pan. Cover and refrigerate for several hours or at least 1 hour. Preheat charcoal grill. Prepare Blueberry Chutney Sauce. Place chicken breast 5 to 6 inches over medium-hot coals. Cook about 6 minutes on each side or until juices run clear and chicken is no longer pink inside. Baste once with reserved marinade towards end of cooking time for final glaze. 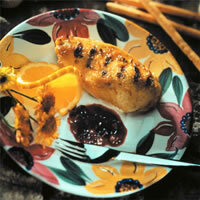 Serve each piece of chicken with 2 or 3 spoonfuls of the Blueberry Chutney Sauce. Garnish with orange slices. Blueberry Chutney SauceIn a medium saucepan, heat oil. Sauté onion 2 minutes or until soft. Add the remaining ingredients. Simmer over low, stirring often, 15 minutes or until mixture thickens slightly and the blueberries become soft. Use at once or cool and refrigerate. Rewarm as needed.